This live disc from the latest lineup of Styx should please long-time fans, but it really does have a few flaws. The first flaw is the lack of Dennis DeYoung. Lawrence Gowan, a very renowned and potent vocalist in his own right, fills that void. The only problem is that for the most part, he really doesn't pull of f the style and presence that DeYoung had. The result is that the group really should seriously consider either convincing DeYoung to return to the fold or dropping the majority of those songs from their set. The second flaw is the group's choice of material. Styx was a very prolific band and, even if they remove the DeYoung material from the list, they certainly have enough songs under their belt to put together a complete set. Why is it then that they choose to perform a Damn Yankees (Tommy Shaw's band) song, one by vocalist Lawrence Gowan and an unrelated cover. It seems that if fans are paying their money for Styx, they want to hear Styx songs. Both of those issues aside, though, the group does put in a strong showing and this album holds up well. It is good to know that there is a Styx carrying the banner in the 21st century. The lineup of the group these days is longtime member Tommy Shaw, fellow veteran James "JY" Young, Todd Sucherman, Glen Burtnik, Lawrence Gowan and founding member Chuck Panozzo. A smoking rendition of this killer rocking number musically, this one really suffers from the lack of Dennis DeYoung's vocal presence. It seems kind of odd to hear Styx doing a Damn Yankees' song. Granted it is a Tommy Shaw Damn Yankees' song, but something really feels wrong about this. Again, this Styx classic really doesn't hold up so well without Mr. DeYoung's vocals. The chorus still gels, though. This one is actually a Gowan song, the man who is filling DeYoung's shoes these days. It is a very strong cut. It is actually very prog oriented, powerful and emotional. This is a hard rocking cut that leans toward an '80's metal sound. A European sounding ballad, this comes across really well here. In fact, it is a great live rendition that rivals the studio version. This hard rocking Styx classic works very well here. This great balladic progish number is another that this grouping really pulls off well here. A hard rocking prog cut, this one is also a very strong live showing. A cover of a song by Patti Smythe and Don Henley, this is a pretty and touching ballad of which Styx does a good version. 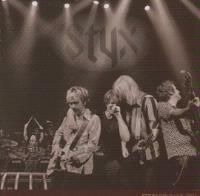 A classic Styx number, this one has always been one of the best prog examples of the group's repertoire. It holds up very well and is performed quite successfully here. One of the biggest classics of Styx' prog era, this one is another that they pull of with flair in this performance. Another of the Dennis DeYoung cuts, this one seems to fare better with Gowan on it than the others. In fact, it really seems to flourish in the treatment this group gives it.